Washington State University is playing a vital role in the World Health Organization’s effort to eradicate human rabies from the planet by 2030. Rabies is the most lethal zoonotic disease – those diseases that pass from animals to humans – on the planet. Each year more than 5​9,000 people die from rabies. The deaths are mostly in Africa, India and other parts of Asia, where 99 percent of rabies cases are found. Half of the deaths are in children younger than 16. The disease is easily preventable in humans with regular dog vaccinations, or by a series of post-bite vaccinations starting within the first 24 hours after a person is bitten by a rabid dog. But once symptoms appear, the disease is always fatal. “Eliminating human deaths due to rabies, 99 percent of which are due to bites from rabid dogs, is for the first time in history within our grasp,” said Guy Palmer, the university’s senior director of global health and a Regents professor of pathology and infectious disease. To achieve their goal, the WHO will partner with the World Organization for Animal Health, the Food and Agriculture Organization of the United Nations and the Global Alliance for the Control of Rabies. WSU’s Paul G. Allen School for Global Animal Health is part of GARC and works with these partners around the world. 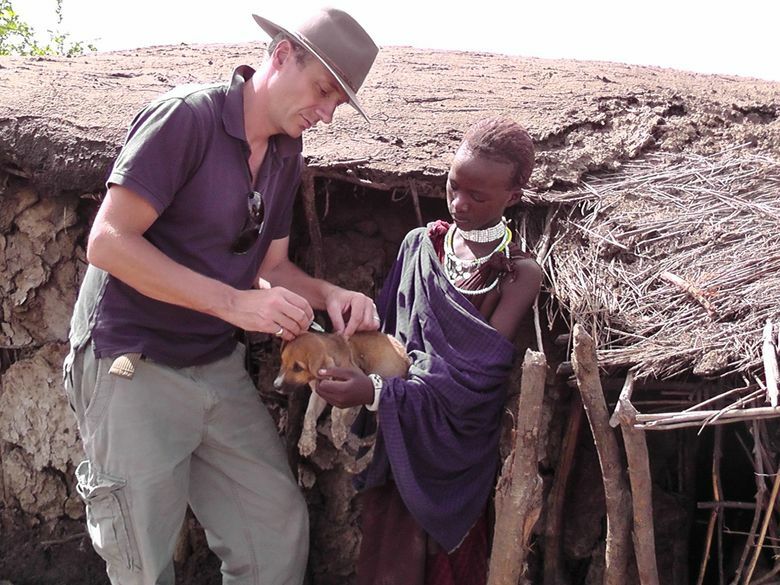 The WSU works with international partners to help reduce the threat of rabies to people in and around the Serengeti National Park in northern Tanzania. The goal is to use this rabies-free vaccination zone as a model in other parts of Africa and Asia. The research conducted so far shows that vaccinating 70 percent of the dogs in a population will reduce the number of human cases to zero. Research conducted by the Allen School in Tanzania is done in cooperation with colleagues from the Serengeti Health Initiative, a consortium including the University of Glasgow, Lincoln Park Zoo and with vaccine provided by MSD Animal Health. Since the rabies project began, the human incidence of rabies in the vaccination zone has been reduced to almost zero. The vaccination zone is a belt of land 10 kilometers wide (or about six miles) that stretches more than 680 miles all the way around the Serengeti National Park in East Africa, covering a total area of about 425 square miles. Domestic dogs are the reservoir for the disease in Africa and Asia. 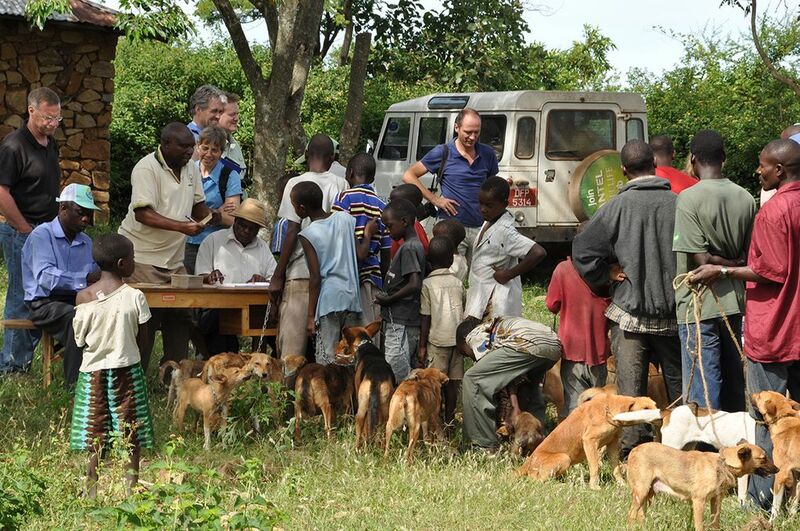 Vaccinating dogs around the Serengeti prevents rabies from spilling into the park and also protects endangered carnivores, such as African wild dogs and lions, as well as other wildlife species from the disease. The rabies team, led by Felix Lankester (clinical assistant professor for the Allen School), vaccinates hundreds of dogs each day. Some days it is as many as 1,000 dogs. They visit 220 villages every year in seven districts adjacent to the Serengeti. They never turn anyone away. The long-term plan is to eventually have the vaccination program implemented by local communities. But in order for it to be a success, researchers at the Allen School must find a way to reduce the cost of administering the vaccinations. One strategy to lower the cost of the vaccinations is to have community members work with the veterinary district offices, rather than hiring teams to travel around setting up clinics in the various communities. A research team led by Dr. Lankester is conducting studies on the effectiveness of rabies vaccines stored without refrigeration, which would make the distribution much easier in remote areas. A major challenge is the creation of a reliable vaccine bank that would provide a consistent and affordable vaccine supply for countries to draw on and then replenish. There are several reasons why rabies continues to be so prevalent in many parts of the world. One challenge is getting the vaccinations to the most vulnerable people in resource-poor countries. Many areas in rural Africa, for example, do not have electricity and currently the vaccine needs to be stored at cold temperatures. The cost of the vaccine is also too much for many families. The Allen School has set a goal of raising $10 million to extend the rabies elimination project to other parts of Africa and Asia. Funds will be used to develop a reliable vaccine bank and improved distribution, as well as conduct research to learn how to best work between countries where border regions are so critical. Ten dollars will vaccinate a child’s dog from rabies, protecting the dog, its human family and the community as a whole. Learn more or donate to the effort at eliminaterabies.wsu.edu.